After a hard fought victory over Venus Williams on Centre Court, Germany’s Andrea Petkovic has been awarded a semi-final match against the younger of the two sisters and current world No. 1 Serena Williams. This marks the fourth time these two competitors will meet on the professional tour and the third time so far this season. Williams holds an unblemished 3-0 Head to Head record against Petkovic and has not dropped a set against her since 2010 on clay. The last match on centre court featured a thrilling battle between world No. 1 Serena Williams and Ana Ivanovic, whom she had lost to at the Australian Open earlier in the season. It appeared as though the Serbian star was on her way to another shocking victory as she stormed to a 6-2 lead in the opening set. 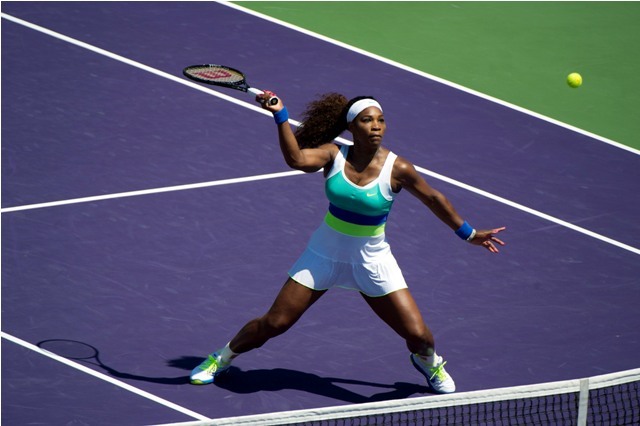 Williams rebounded in the second set and snatched a crucial break to level the match after 75 minutes of court time. The third set saw a seesaw affair between the two competitors, as Williams shot to a 3-1 lead and looked to serve the match out at 5-3 before losing serve and allowing Ivanovic to level the match at 5-5. Williams eventually found another break of serve and closed out the match 2-6, 6-3, 7-5. In the other quarter-final of the day, Germany’s Andrea Petkovic sneaked past Venus Williams to secure her spot in the final four in Stanford. The No. 8 seed may have needed three sets to earn the victory but eventually closed out the match 6-1, 3-6, 7-5 in 1 hour and 49 minutes. Apart from Venus’ spurt in the second set, Petkovic maintained command of the match and forced the former world No. 1 to play catch-up in the deciding set. Petkovic is now in a position where she has to face both the Williams sisters in two consecutive days. In their previous two encounters this season, Andrea Petkovic was simply unable to stay competitive will Serena, who overwhelmed her with forehand winners and a powerful serve. Their most competitive meeting was at Brisbane, which Williams still won in straight sets. The American was able to overcome an inspired Ana Ivanovic on Friday night and it is unlikely that she will be faced will a more difficult task against Petkovic. With Petkovic’s personality she is dancing whether we see it or not. She get’s it, she’s the most pleasant woman in tennis. She’s hard on herself but always respectful of her opponent. What a wonderful gift: to enjoy a game she is so good at and have a great sense of humor in doing what she loved. When she hugged Serena after her loss it was gratifying to see. Bringing back the DANCE would only make her more precious!